2013 and 2014 marked pretty quiet years for Benchmade. Not a whole lot of interesting stuff rolled off their shelves. The Volli was my favorite and has proven itself to be an excellent knife. Beyond that there wasn’t a whole lot to report. Benchmade’s 2015 SHOT Show releases actually looked pretty strong. The 485 Valet was one model that caught my eye. Perhaps most surprising was that the knives became available about a week after the show. Gone are the days of lusting over pre-production tools at SHOT only to find them released sometimes years later. Initially I was going to hold off on acquiring a Valet, but all it took were a couple positive affirmations from Tony regarding his knife and I had a Valet en-route to my office. The Valet has an overall length of 6.69″, a 2.96″ blade, and it weighs 2.18 ounces. The knife compares favorably to the Benchmade Mini Griptilian although it’s much sleeker. The low profile handle and spear point blade were innately appealing. This is a slim every day carry (EDC) piece that easily doubles as a gentleman’s folder with a more modern flair. The Valet’s packs plenty of cutting edge, a high flat grind, and a sturdy tip all into a sub 3″ blade. The blade is ground thin and it almost cuts like classic slip joint (not a bad thing). I had no trouble zipping through boxes, bags, and all the little stuff that comes across my path. Everything from sliding between the folds of an envelope free a cable bill to de-boning chicken thighs for a stir fry. Benchmade went with Bohler M390 stainless steel for the Valet. I have been putting M390 through its paces between this Valet and my ZT 0620. 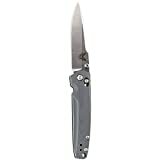 Heat treated to 60-62HRc, M390 is a super steel with superior edge holding abilities, yet it is still easy to maintain. I have been putting the Valet through it’s paces, and I’ve been happy with the results. I sliced up a big stack of cardboard in an informal “cut test” and managed to wear the edge down a bit after a while. I ended up sharpening the knife on the fine stones of my Sharpmaker. After just a few passes I could tell the edge was coming back, and I was able to quickly restore the edge to hair shaving, paper slicing performance. M390 is also very corrosion resistant. M390 is apparently very expensive (on a podcast Tony and I determined that it appears to sell for 3x as much as a more normal steel). Given the option I would have selected a S30V or 154CM version if it meant a substantial reduction in purchase price, but I appreciate that Benchmade is interested in offering a premium product. The Valet has a sleek gray handle with smooth G10 over milled out stainless steel liners, and a gray G10 backspacer. Handle construction is typical Benchmade quality. The G10 is contoured (3D machined) has been nicely finished. The steel liners are flush, and the backspacer sits solidly in the middle. I like the gray. It’s different, but nothing crazy. This isn’t a big handle, but it’s well made. The Valet is a small knife and it feels like a small knife. I’m able to get a full grip on it, but there isn’t much room beyond that. It’s perfectly fine for little EDC tasks. There is no jimping, or much in the way of notable ergonomic features. The little knife sits in your hand well enough, and is more than adequate for normal use. I did not find the smooth G10 to be “slippery” and did not have any issues using the knife normally. The pocket clip is a nice stainless steel deep carry clip. It buries almost completely into the pocket and is discrete. The handle is drilled and tapped for ambidextrous tip up carry. I like this clip and I think it works well. The Valet also carries really well. At under 3 ounces and you quickly forget the knife is in your pocket. Perfect as either a discrete primary EDC or a lightweight backup knife. This is an axis lock knife, with thumb studs. Usually, that would be all I need to hear, but I am concerned that this time Benchmade may have tried to do too much with too little. The positioning of the thumb studs and axis lock feels cramped. The axis lock is smaller than on other axis lock knives, and the thumb studs sit very close to the handle. The knife looks cool, and it certainly works, but it isn’t the most comfortable knife to open and close repeatedly. I’ll be curious to see if anyone shares that opinion with me. Lockup on my knife is good. Out of the box there was a tiny bit of horizontal blade play, and a little more developed after a month of use. Pretty much all of my axis lock knives have a little play in them unless I tear them down and loctite the pivot. I know some people aren’t fans of the axis lock (too many moving parts and small springs to break), but I have always liked them. This one is smaller than I’m used to, but it still works. I am a little divided on the Valet. On one hand, it is a really slick little folder. I have been getting more and more into gents folders for daily carry, and visually this one ticks a lot of boxes for me. I like the smooth G10 handles, and the thin flat grind and spearpoint blade are excellent. My knife came well finished, and I didn’t run into any major QC issues that some folks have reported on first run Benchmades. But a couple things turn me off on the Valet. The fiddly “landing gear” (small thumb studs placed very close to the knife and small axis lock) is my biggest concern. I would not recommend this knife for people with larger hands. I’m not Andre the Giant, but the position of the lock and thumb studs seems too tight for repeated use (or the mindless flicking open and closed of pocket knives while watching TV). Certainly this could be a “Your Mileage May Vary” thing. This is a beautiful knife, but I think BM leaned a little into far into “form over function” territory on this one. I also think the price is also worth mentioning. $170 is a large sum for a small knife. I would have loved to see the Valet on the tail end of $150, and not on the tail end of $200. I realize that M390 is expensive material, and I think that folks who really appreciate a premium steel will have an easier time justifying the cost. Personally, I am not convinced this steel is worth the extra money. But I don’t mean to end this review on a down note. The Valet potentially has a lot to offer. If it fits your hand well then there is little left to complain about. The Mini Griptilian is still my go to small Benchmade, but the Valet could be a worthy upgrade if it fits your hand and budget. I recommend purchasing the Valet at Amazon and BladeHQ. Please consider that purchasing anything through any of the links on this website helps support BladeReviews.com, and keeps the site going. As always, any and all support is greatly appreciated. Thank you very much. I’ve mentioned a couple times before that every now and then I get the urge to pick up an Emerson, and make it my EDC. I know the knife is going to be too large for me to comfortably carry, and way overboard when I stop to consider my actual needs for a daily carry knife. But still, like a moth to flame I convince myself that this time things will be different as I hit the “buy” button on yet another Emerson. This is probably like a gal that brings home the guy with bad credit and a pack a day habit, thinking that she will “change” him to one day become the man of her dreams. Well this time around I have no such delusions of grandeur. I bought the Emerson Roadhouse not because I intend to carry it in the pocket of my skinny jeans next to my mustache wax and Starbucks card, but because I really dig the design and wanted to add it to the collection. I know the knife is going to be too big for me to actually want to carry and use, and I could care less. At least this time around I’m being honest with myself. This is a beastly blade and I have always been drawn to the low slung modified tanto design. Frankly, it’s about damn time I reviewed the Emerson Roadhouse and I’m not going to apologize for it. The Roadhouse has an overall length of 8.90″, a 3.80″ blade, and weighs 6.2 ounces. This is a full size folder and was likely designed with law enforcement and military personnel in mind. I’m just a guy with a website and a day job, so my perspective on the knife will be limited to daily carry and use as a tool, rather than a defensive option. The design has proven popular enough for Emerson to roll the Roadhouse out in a variety of sizes. We have the regular (shown here) the Super Roadhouse (4.2″ blade), and the Mini Roadhouse (3.4″ blade). The blade of the Roadhouse is a modified tanto and is one of my favorite shapes from Ernie. I’m not a tanto guy, but I really like this modified tanto. There is a little belly and something of a harpoon and swedge that give the knife some extra attitude. In the product description Ernie tells you to think about Jack Daniels and Harley Davidson’s. I can almost see Patrick Swazye in a dusty corner, the glint of the Roadhouse flitting through thick cigarette smoke and half empty bottles. Oh yeah. I really like this one. Mine blade is a two tone satin finish with stonewashed flats. Like all my other Ermersons, this knife is ground beautifully with a v grind and chisel edge. The blades are the best part of these knives although I see a fair amount of tooling marks on the spine around the wave and jimping. The steel is tried and true 154CM. If it works why mess with it? I certainly don’t have a problem with 154CM, and Emerson has always done a good job heat treating it. People who actually use their knives will tell you that the chisel edge is ground on the wrong side for right handed users, but I don’t let that get in the way of a good time or a cardboard box. I have found the 154CM to be a serviceable steel, but if you don’t believe me feel free to read through my handful of other Emerson reviews. The Roadhouse’s handle is standard black peel ply G10 over a titanium locking liner, and a steel non-locking liner. My knife has a thick partial G10 backspacer. I am pretty sure if you were to buy one new Emerson now offers their knives with standoffs over a backspacer. We have been trained to think that flow through construction is better, but there is something endearing about the G10 backspacer. The hardware is Emerson’s signature phillips head fasteners for the body screws and oversized slotted pivot. There are some tooling marks on the edges of the liners, but beyond that everything is nicely finished. In hand is where the Roadhouse really shines. This is a full size knife and it provides ample room for all your standard grips. In addition to being a long handle, it’s also quite thick. Much like every other Emerson I’ve handled the knife is extremely comfortable. The black G10 offers plenty of traction, and the jimping on the thumb ramp holds your thumb but isn’t overly aggressive. 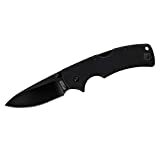 If you can get away with carrying a big knife it’s hard to beat Emerson’s offerings from an ergonomic standpoint. For the same reasons the Roadhouse feels so good in hand, it will be noticed in the pocket. It’s a large knife and there is no getting around that. Even small Emersons have a way of feeling big. The Roadhouse has been outfitted with Emerson’s standard black parkerized clip. It rides low, but not so low that you can’t access it easily. 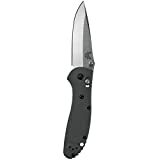 This is a proven clip design and is very comparable to Benchmade’s offerings. As always the knife comes drilled and tapped for right side tip up carry only. For deployment you have a choice of thumb disk or wave feature. I’ve never been a huge fan of thumb disks. They always seem awkward to me. But they are low profile and stay out of the way when you are waving the knife open. The nylatron washers aren’t amazingly smooth, but they get the job done. I’d prefer good ole phosphor bronze, but this isn’t Burger King. I can’t have it my way. I can flick open the Roadhouse with a little effort, but for rapid fail-safe deployment the wave is the way to go. For lock up you have a thick titanium liner. The locking liner is visibly thicker than the non-locking steel liner and I find that reassuring. Lock up on my knife is early and secure. There is a little bit of lock stick, but nothing bad. I prefer a steel locking liner over titanium, but it is what it is. Apparently Emerson’s warranty service is good if you manage to wear down the titanium. I have never had to use their warranty service personally. It’s big, it’s bad, it’s surprisingly expensive. I have always enjoyed the look of the Roadhouse on paper and am happy to report the knife looks just as good in hand. It’s a solid tool, with Emerson’s signature quirks. Despite some tooling marks on the back of the blade and liners, the knife has been carefully put together. The parts line up, the blade is centered, the lock doesn’t stick (badly) and everything feels sturdy and secure. The super nice blade and comfortable handle are high points. The steep price tag and impracticality of the knife (for my suburban purposes) are low points. Regardless, I am pleased to add this one to my collection and recommend the knife if you are a fan of Emerson’s offerings or if the allure of the Roadhouse is just too strong to resist. I recommend purchasing the Roadhouse at BladeHQ or Amazon. Please consider that purchasing anything through any of the links on this website helps support BladeReviews.com, and keeps the site going. As always, any and all support is greatly appreciated. Thank you very much.